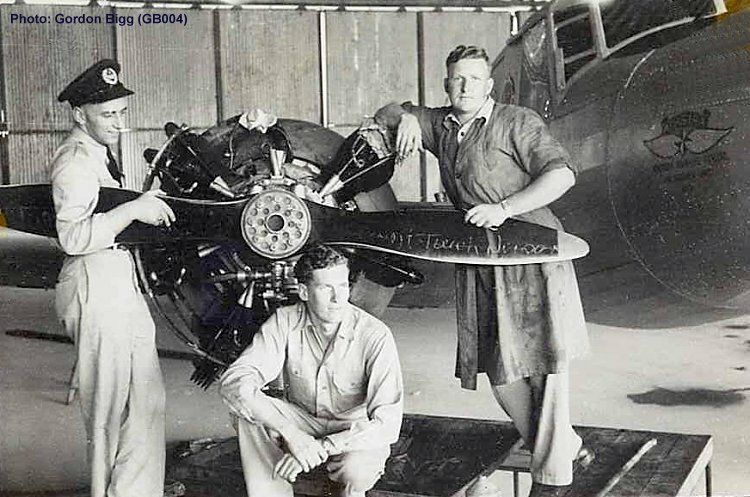 (left to right) Tom Cuthbertson, Gordon Bigg and Tom Carpenter working on Anson VH-AGO at Ballarat in 1946. Tom Carpenter was changing the top cylinder on the Anson's Cheetah. Previously, Tom Cuthbertson was unidentified and the photo was thought to have been taken in the Adastra hangar in 1949. Another print of this photo was found in Tom Carpenter's collection and notes on the reverse have provided this additional information.